Night Shift is the new fantastic feature in iOS 9.3 devices. So, in this today’s tutorial, you’ll learn how to enable Night Shift mode on iPhone and iPad running iOS 9.3. iOS 9.3 has some exciting features for iPhone and iPad users. The new functions and changes contain Touch ID for Notes app, Night Shift mode, updated features for News and Health app, Apple Music and much more. Among these features, Night Shift Mode is the most noteworthy. This feature is intended to help enhance your sleep by minimizing the volume of blue light produced by your device’s display. It not only helps to decrease your eyes stress but also gives you a smooth reading experience at night. The devices which are compatible with the night mode feature are iPhone 5s, iPhone 6, iPhone 6 Plus, iPhone 6s, iPhone 6s Plus, iPhone SE, iPad Air, iPad Air 2, iPad mini 2, iPad mini 3, iPad mini 4, iPad Pro and 6th Generation iPod touch. If you have an older model of iOS device which is not present in the list, then you won’t be able to take advantage of Night Shift. This feature is excluded from the older devices due to Apple deeming that the hardware basically isn’t able of working with the feature. Night Shift is one of the most interesting features available on iOS 9.3. Make sure that you have the latest version of Apple mobile operating system installed on your device. Then follow the below instructions that will help you to use the night shift mode efficiently. 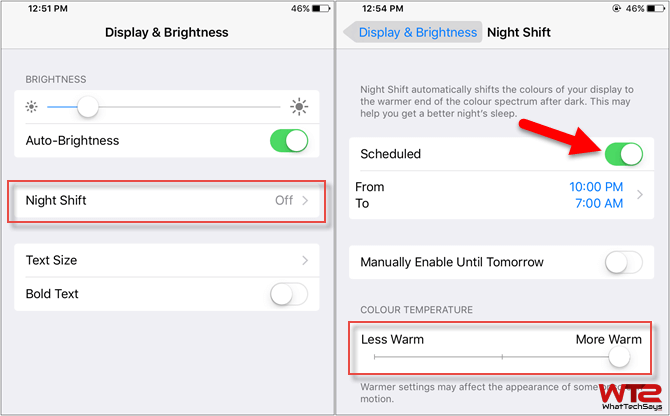 On your iOS device, go to Settings >> Display & Brightness and tap on “Night Shift” option. Here, enable the “Scheduled” button. This option allows you t set a time period when you want to automatically enable and disable the Night Shift feature. After that, adjust the color temperature. You can change the slider right below it to make your device screen “Cooler” or “Warmer” based on your requirement. Rather than set it in auto mode, you can also enable it manually. 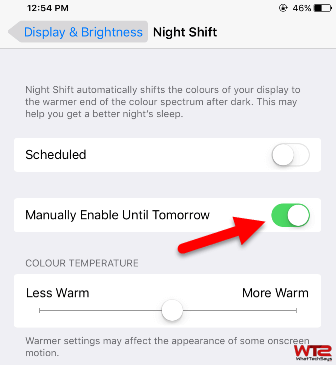 If you need the night shift option right now, then without changing the scheduled time you can enable it. Choose the “Manually Enable Until Tomorrow” option to activate night shift mode instantly. After enabling the feature, you can adjust the color temperature according to your requirement. Without going to your device’s settings, you can activate it directly on your device’s “Control Center“. Swipe up from the bottom of the screen to view Control Center and tap on the Night Shift icon from the screen. For better understand, follow the above picture. The process to disable Night Shift mode on iPhone or iPad in iOS 9 is super easy. Just go to your device’s Settings >> Display & Brightness and tap on “Night Shift” option. Here turn off any of the option which is enabled; Scheduled or Manually Enable Until Tomorrow. That’s it. 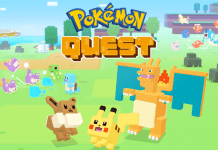 If you work on late night on your iOS device, then this might give you a good experience for your eyes. 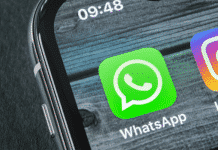 Many third-party software like flux has the option to enable night shift mode, but Apple doesn’t allow these type of apps without jailbreaking.